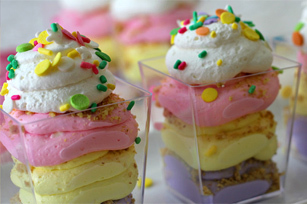 Tinted in pretty pastels, these creamy cheesecake parfaits are easy to make and perfect for the Easter dessert table. COMBINE Cream Cheese and Sugar in a large bowl and beat until smooth. RESERVE ½ cup of COOL WHIP Whipped Topping. FOLD in COOL WHIP Whipped Topping until well blended. TRANSFER to airtight container and place in refrigerator for 3 hours. REMOVE from refrigerator and divide into thirds, color each with food coloring. TRANSFER into plastic resealable bags or decorator bag fitted with a large round tip. ADD Graham Crackers to a resealable bag and crush. SQUEEZE Cheesecake mixture into dessert glasses, adding crumbs between each layer. ADD reserved COOL WHIP Whipped Topping to a resealable bag and add a large dollop to the top, add sprinkles if desired. STORE in refrigerator until ready to serve, store leftovers in refrigerator.